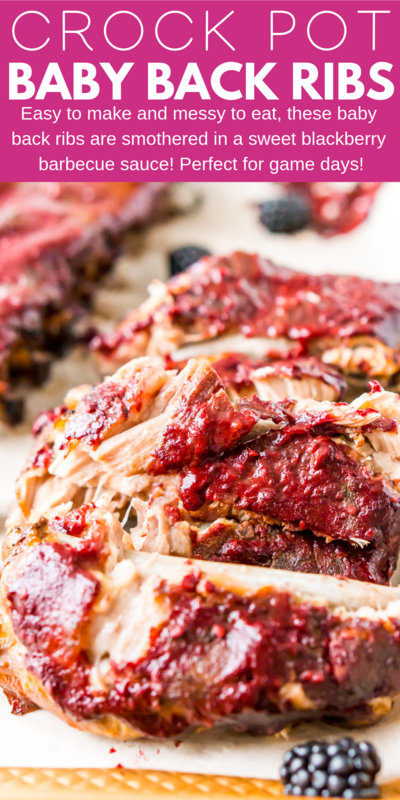 These Crock Pot Ribs are juicy, tender, and full of flavor! 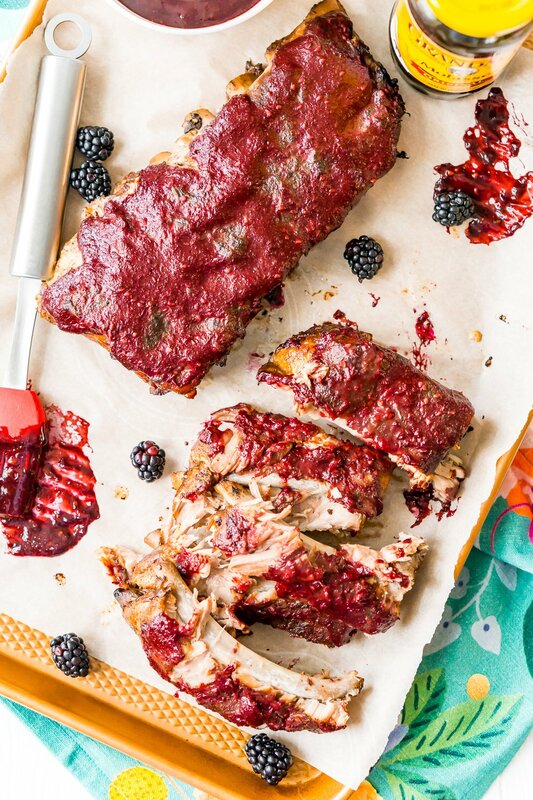 Easy to make and messy to eat, these baby back ribs are smothered in a sweet blackberry barbecue sauce! Perfect for game days! Crock Pot Ribs are the easiest way to make this sweet and smoky favorite. Since there’s no need to pull out the grill, so you can make this dish any day of the year! 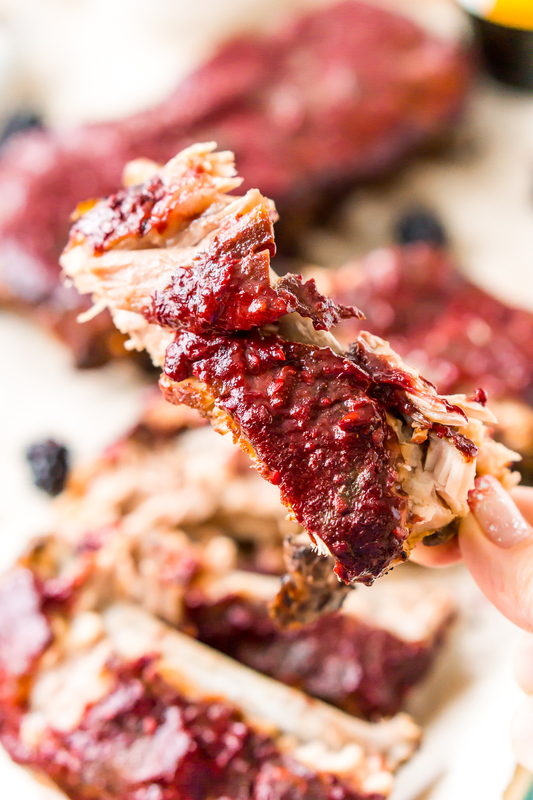 Crock Pot recipes are the best kind of recipes, and these Baby Back Ribs are super simple to make. You won’t make a mess in the kitchen, but when it comes to chowing down … well, that’s a different story! 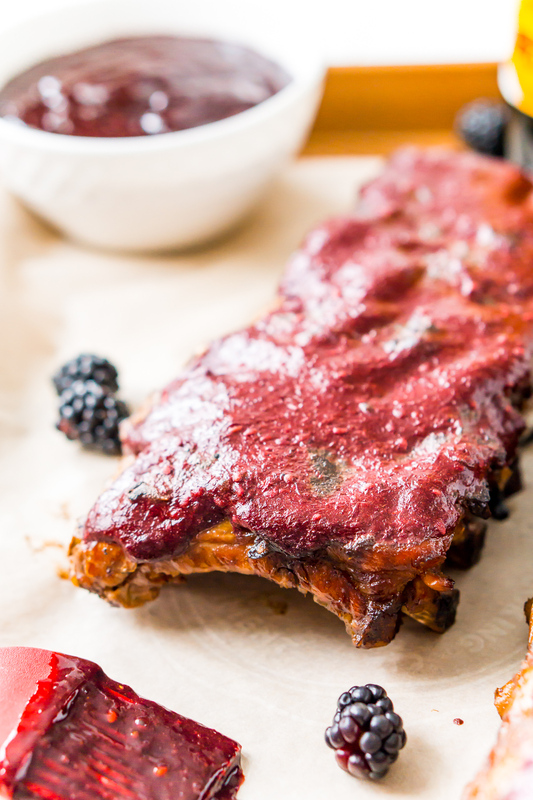 These tasty ribs are a hit when served on game day. Or, add corn casserole or baked beans for a family favorite dinner dish. 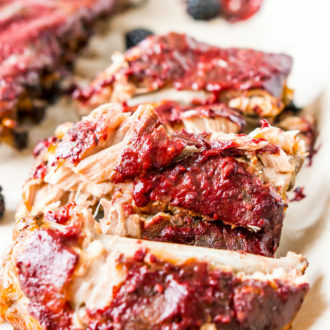 Slow Cooker Ribs are roasted in a sweet and savory sauce, then cooked for several hours. The result is fall-off-the-bone meat that’s tender, juicy, and incredibly delicious. 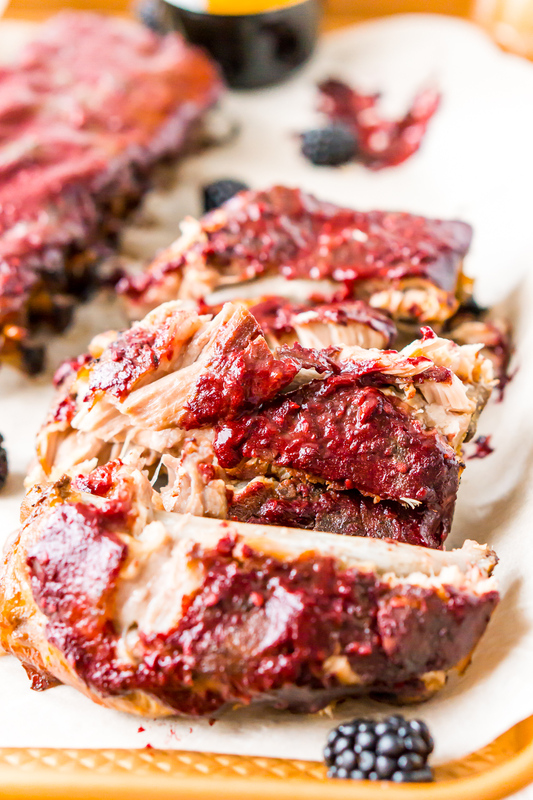 Blackberry Barbecue Sauce takes Crock Pot Ribs to the next level! The homemade sauce is a blend of molasses, blackberries, garlic, ketchup, balsamic vinegar, brown sugar, a dash of hot sauce, salt, and pepper. Remove the membrane from the back of your ribs and cut the ribs down so they fit in your crockpot. I recommend using a 6-quart or larger crockpot! 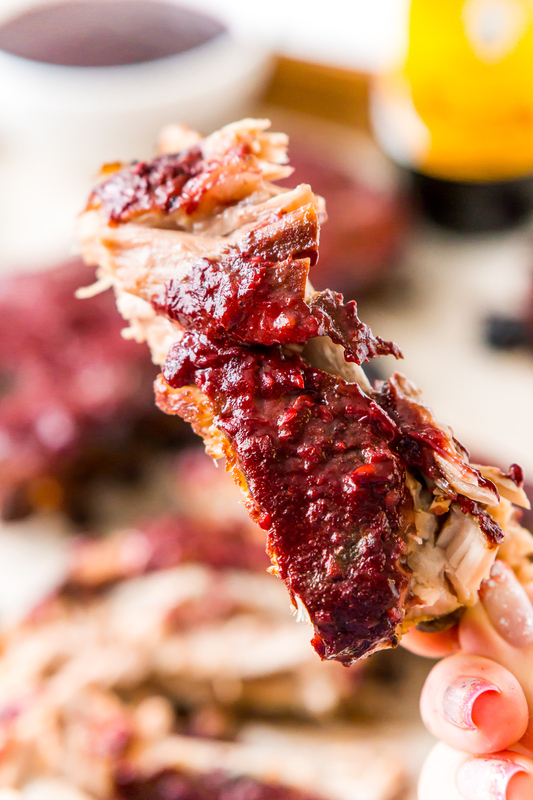 Add the sauce ingredients together in a food processor and process until smooth, then brush it all over the baby back ribs in the crock pot — that’s all! But reserve some of that delicious sauce for the end! Let the ribs cook in the crockpot and once the ribs are done cooking you’ll want to place them on a baking sheet and brush the remaining sauce over the top and broil them for a few minutes. This gives the ribs that mouthwatering and tasty finish! My Favorite Crock PotBuy Now! This Baby Back Ribs Recipe may be reminiscent of summer cookouts, but it’s also cozy enough to enjoy all winter. Let’s just say, there’s really no bad time to enjoy them, especially when the recipe is this easy! It’s also one of those meals that are perfect to serve for company. That’s because the prep is minimal, there’s tons of hands-off time, and it’s a total crowd-pleaser. Don’t forget, Crock Pot Ribs also taste delicious as leftovers. Strip the meat from the bone and serve with rice, in tacos, or you can make a pretty killer sandwich, too! Make sure to keep this Baby Back Ribs Recipe handy. It’s easy enough for a weeknight but tasty enough for company, you’ll find lots of occasions make it! Remove the membrane (shiny/white tissue) from the back of the ribs by flipping the ribs so they are meat-side down and work your fingers under the membrane and peel it off. Cut your ribs down so they fit comfortably in your crockpot and you can put the lid on. I recommend a 6-quart crockpot or larger. Add the remaining ingredients into a food processor or blender and process until a sauce forms. You may leave the seeds in the sauce or run the sauce through a sieve to remove them - totally up to you. Place the ribs in the crockpot, you can layer then, but brush a thin layer of the sauce over the top of each layer of ribs. DO NOT dip the brush directly into the sauce after brushing the ribs, just pour a little on the ribs and brush it over the surface. You want to reserve about half of the sauce for later. Cook on high for 4 to 5 hours or low for 8 hours. Once the ribs are done in the crockpot. Transfer them to a parchment lined baking sheet and brush the remaining sauce over the tops of them and broil for 3 to 5 minutes. Remove and enjoy.